If it is switching action you're after, the industrialized Delta region of eastern Contra Costa County has plenty to offer. Road switchers stationed in Pittsburg work in the yards between the DuPont chemical plant located at Milepost 1147.6 in Oakley and the USS-POSCO steel mill at MP 1155.0 in Pittsburg. 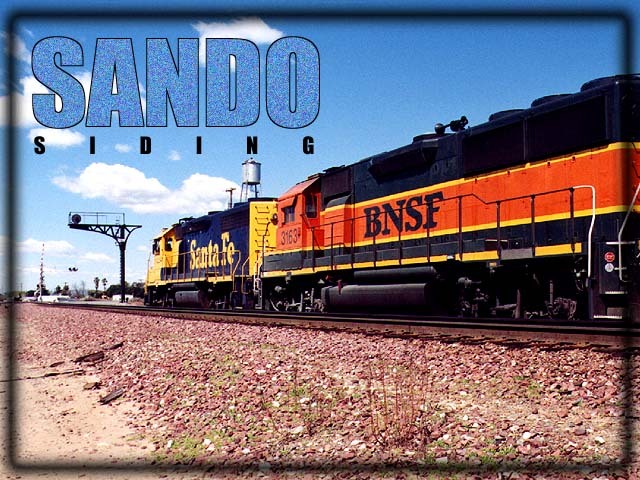 In addition to those two major rail customers, the Burlington Northern Santa Fe also services the Gaylord paper mill, Western Steel and Tinplate, Kemwater and Georgia Pacific, among others. Sando is one of several sidings where trains are stashed with great regularity to make way for other traffic. It is not uncommon to find long freights sitting "in the hole" amid the sea of boxcars that are also kept here for use at the Gaylord California Mill. Wilbur Avenue crosses the BNSF mainline at the Georgia Pacific plant, affording motorists a view of the action from above. Easy access trackside can be had from Minnaker Drive, the ballfields on Apollo Court and Fulton Shipyard Road. 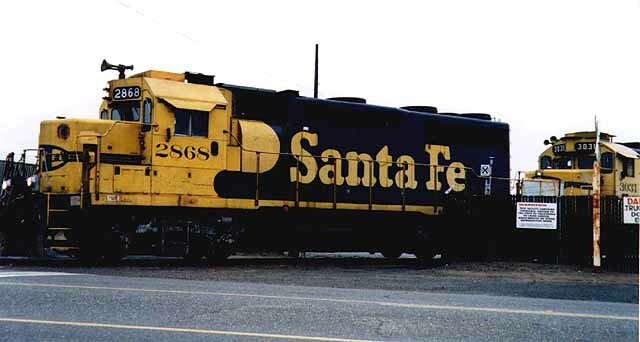 It is February 1998 and the Santa Fe 2868 is working at the entrance to the Gaylord paper mill on Wilbur Avenue in Antioch with sister unit 3031. The two locomotives have just backed a string of boxcars into the plant from the Sando siding at the base of the hill below the plant. This almost daily ritual usually ties up traffic for several minutes. Photo by Roni Gehlke. The Santa Fe 2704 heads back down the hill toward the yard after making a delivery at Gaylord. Kemwater is visible to the right. This photo was taken in late July 1998. Photo by Roni Gehlke. Sometimes it takes three to handle the heavy loads of paper pulp generated by the Gaylord plant. On a frosty morning in January 1998, a trio of small road units shunts boxcars in the yard at Sando. That steam you see is from the Georgia Pacific paper products plant. On certain cold winter nights this area is often thick with tule fog, and output from the factories just adds to the eerie atmosphere. This shot was taken from the Gaylord-donated ballfields located near the tracks. Photo by Roni Gehlke. Same units as in #3, only a slightly different photo and crop. This was basically an exercise in photo cropping. It is amazing the difference a crop can make to a picture. It also amazes us that not more railfans take advantage of this wonderful tool. Photo by Roni Gehlke. 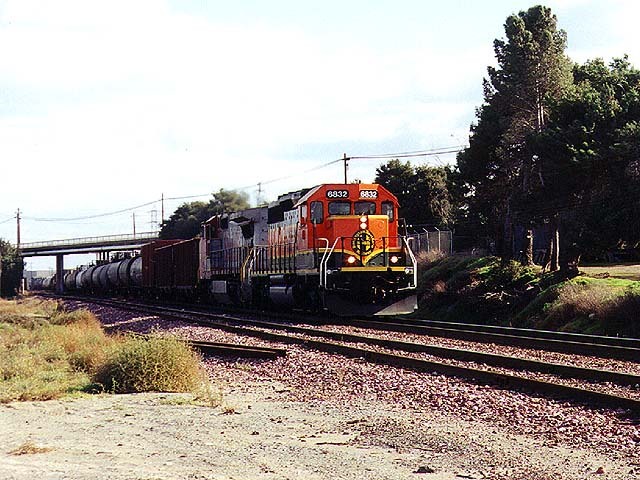 ATSF 3694, a GP39-2, is kicking cars in the yard near the Gaylord California Mill on a crisp morning in November 1998. This shot was made with an inexpensive box camera as I drove along Wilbur Avenue. I basically just stuck the camera out the window with one hand while grasping the steering wheel with the other and fired off a couple of frames. (Please kids, don't try this at home!) The train and I were both heading the same direction (to the left). I got lucky -- with the photo, I mean. Those are the Gaylord community ballfields in the background, a good train-watching spot. Photo by Glenn Gehlke. The north side of Minnaker Drive leads into the Georgia Pacific plant. The court outside the front gate is an ideal place to pull over and wait for freight, like this westbound stack train that passed our camera in August 1998. Photo by Roni Gehlke. 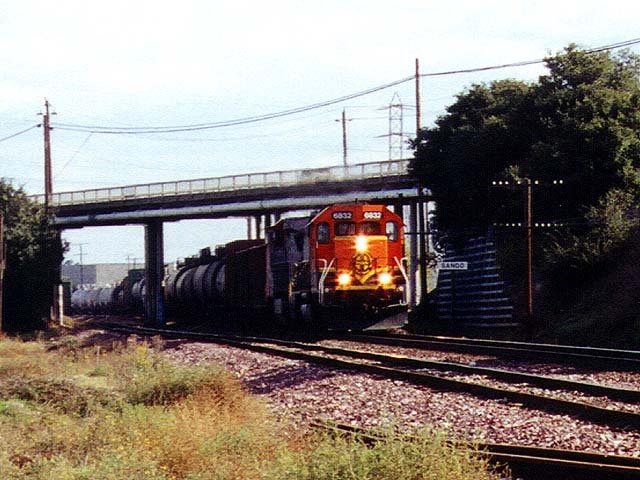 Here we see BNSF 6832, an SD40-2U, as it emerges from beneath the Wilbur Avenue overpass in January 1999. We scanned this photo at a substantially larger size than the original image so that you can see the station sign, which is located just to the right of the locomotive. Photo by Roni Gehlke. Another shot of BNSF 6832, taken moments later. The track visible in the foreground is the lead track into the siding. Photo by Roni Gehlke. Now we're at the crossing on Fulton Shipyard Road, one of the few places in these parts where you can still see cantilever signals; several were removed in the double-tracking of the BNSF mainline between Oakley and Bixler. 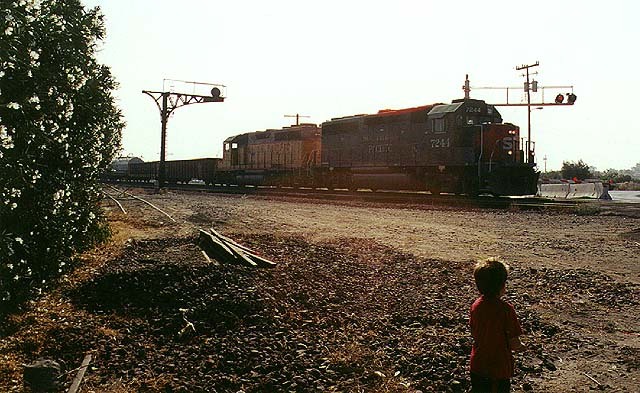 It is a Sunday morning in late October 1998 and the local has paused on the siding to allow a through freight to pass. We shot this outside the Black Diamond Lines model railroad clubhouse during their annual fall open house. Photo by Roni Gehlke. 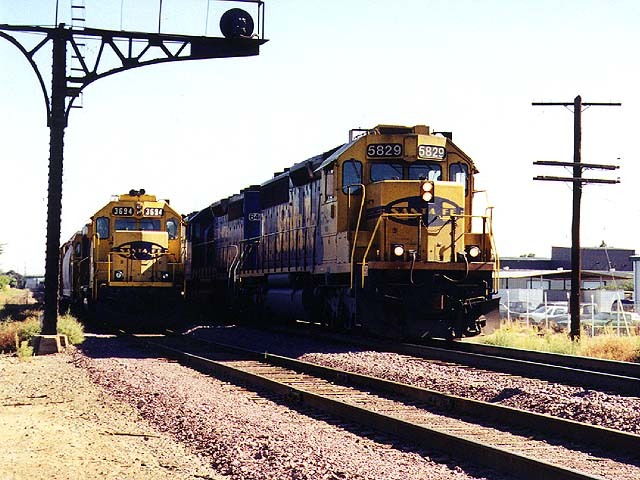 A pair of GP50s wait in the hole for an approaching eastbound freight in early April 1999. The freshly painted BNSF unit caught our eye. This is one of our homemade postcards. Photo by Roni Gehlke. Because the nearby Gaylord paper mill ships its product all over the country, it is not uncommon to see the rolling stock of small regional carriers waiting in the yard at Sando. 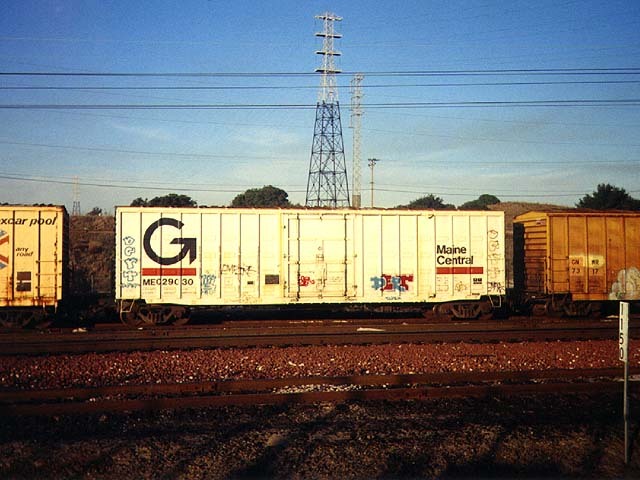 In early February 1999 we discovered this Guilford boxcar, which was at least 3,000 miles from its home in New England. Photo by Glenn Gehlke. SP 7244 leads the UP Steel Train west through Sando at Fulton Shipyard Road in Antioch on the morning of Oct. 23, 1999. Our son Benji has torn himself away from the action at the nearby Black Diamond Lines model train show long enough to enjoy some real railroading action. Photo by Glenn Gehlke. This page was last updated Tuesday, November 16, 1999 at 00:25 hrs.